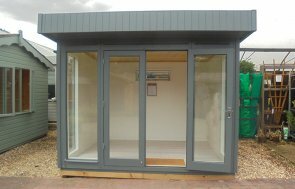 This attractive looking Salthouse Studio has been installed in our customer’s garden in Ware, Hertfordshire for the customer to relax and enjoy their garden in. This Salthouse is 3.0 x 3.6m in size with a roof overhang, heavy duty felt roofing material and a wall of full-length glass. There is a door on the right of the front wall, with four windows next to it, all made from full-length glass, to let a lot of light in and to allow the customer a great, full view of their garden. There is also another full-length glass window on both gable ends, and two fanlight windows high up on the gable ends for some ventilation. The studio has been painted in our Valtti Taupe paint system, and this natural, earthy colour has been mirrored inside the building as well, with natural matchboard lining on the walls and a natural timber floor. 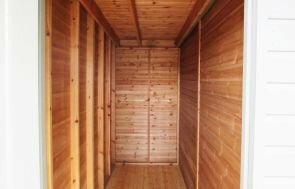 Inside the studio, there is also insulation in the floor, walls and ceiling and an electrical pack, so the customer will be able to make use of their building all year round. The door and window furniture is polished chrome and there are draught excluders in the doors and windows as well. 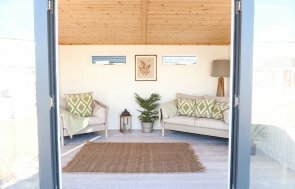 If you would like a Garden Studio, you can download the brochure to view the different styles we make, or you can Contact Us online or on the phone by calling 01760 444229 to speak to a member of our helpful team.